free delivery within 10 miles of kingswinford. 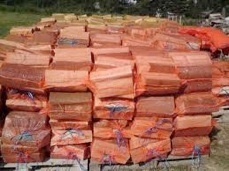 We supply high quality seasoned firewood. All our firewood is seasoned for approximately 2 years and has a moisture content of around 20%. Since our wood comes from our tree surgery business it is made up of a variety of species but will be 100% Hardwood. 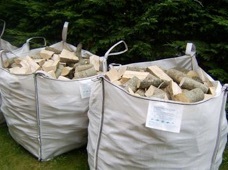 We sell either in bulk bags, vented barrow bags, net sacks and large bulk load delivered right to your log store. Prices include free delivery within 10 miles of Kingswinford/Stourbridge and surrounding area. £30 per bag + £5 deposit if you require to keep bag. There is approximately 3 mini bulk bags to a large builders bag. Please Call us on 01384 346668 to discuss your firewood requirements. £3.50 per net minimum order of 10 nets for free delivery. 3 builders bags or 9 Barrow Bags. Please note: All our prices include delivery right to your log store and not just tipped on your drive! High Quality Seasoned Firewood with Free delivery within 10 miles of Kingswinford and surrounding areas. PLEASE NOTE: There is a £5.00 deposit on our Vented barrow bags, which will be refunded on return of the undamaged bag.